HPM Hobbies – Singapore $28.00 (with free postage). This package ticks all the right boxes for research, modelling guidance, and product quality. 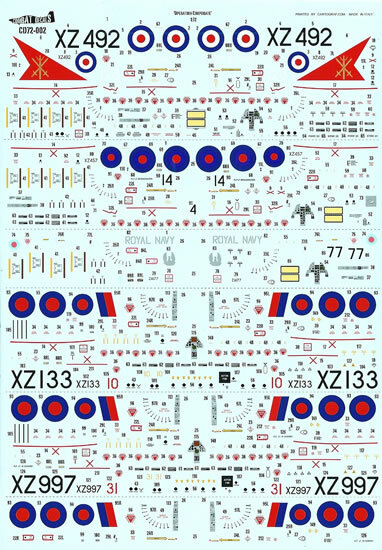 It is an ideal package for a group-purchase, as there are sufficient decals for each of the eight schemes to be completed. The decals come packed in the near universal A-5 sized zip-lock plastic bag containing instructions and two sheets of decals. 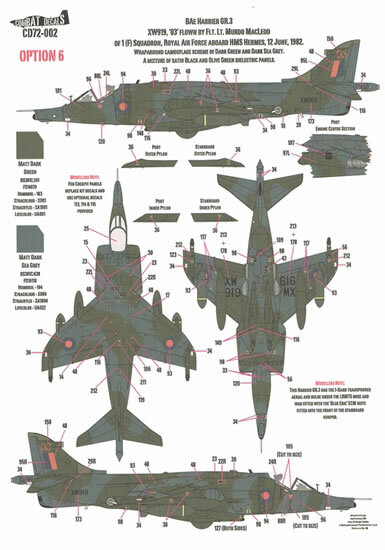 The instructions are produced to very high standards, with each subject covered by a glossy A-4 page in colour. Individual detailed notes for each subject are given on the back page in small print. 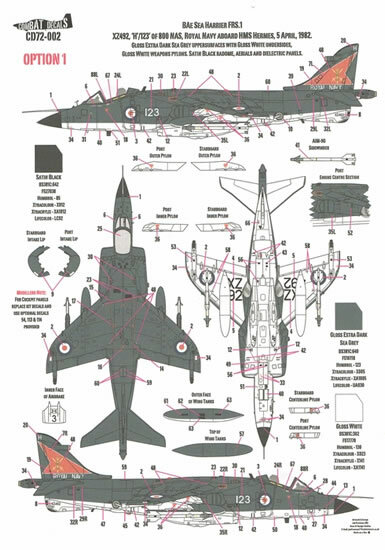 Modeller’s notes for each subject accompany each guide, along with four-view colour plans of the subject aircraft. 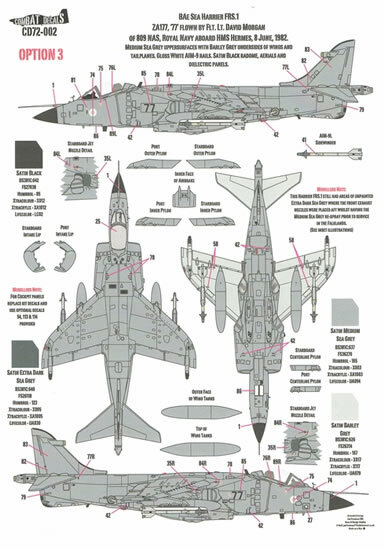 There are separate drawings within the guides detailing markings for such items as drop-tanks, missiles, stores-pylons, and jet exhausts. In fact, they provide a number of details specific to each subject that aid authenticity. It is apparent that a detailed effort has obviously been made in researching this package. 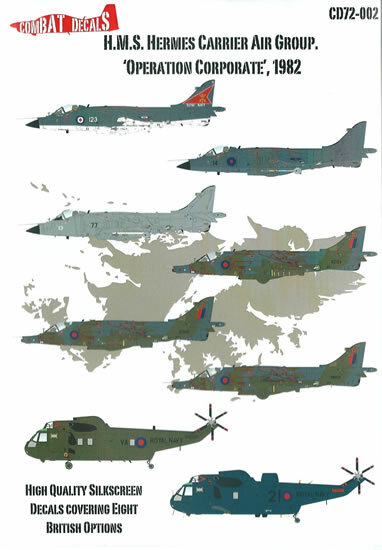 To give just one example; Sea Harrier XZ457 flew with green Aden cannon pods from an RAF Harrier GR.3, and amongst other things, had duct tape placed diagonally over the camera glazing and a Liverpool FC zap applied to the portside warning triangle. Printed by Cartagraf, these sheets are some of the best quality decals that I can recall reviewing. They are perfectly registered with good colour density; they have only minute amounts of surplus clear carrier film, and a gloss finish. The subjects covered by the sheet represent a nice cross-section of subjects given the limited number of types from which to choose. XZ492 "H"/123 of 800 NAS, RN aboard HMS Hermes, 5th April, 1982. XZ457 "14" of 800 NAS, RN, aboard HMS Hermes, 24th May, 1982. ZA177 "77" of 809 NAS, RN aboard HMS Hermes, 8th June, 1982. XZ997 "31" of 1(F) Sqn, RAF aboard HMS Hermes, 14th June, 1982. XZ133 "10" of 1(F) Sqn, RAF aboard HMS Hermes, 14th June, 1982. XW919 "03" of 1(F) Sqn, RAF aboard HMS Hermes, 12th June, 1982. Westland Sea King HC.4: ZA298 "VA" of 846 NAS, RN, aboard HMS Hermes, 13th June, 1982. 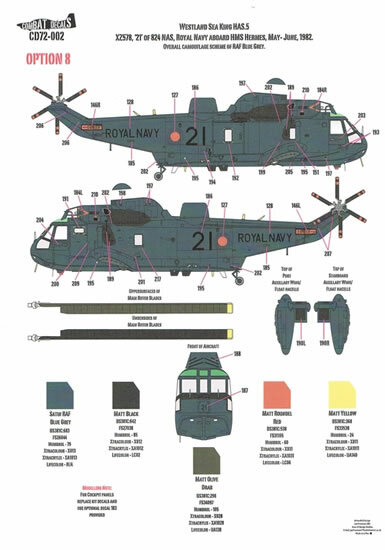 Westland Sea King HAS.5: XZ578 "21" of 824 NAS, RN, aboard HMS Hermes, May-June, 1982. 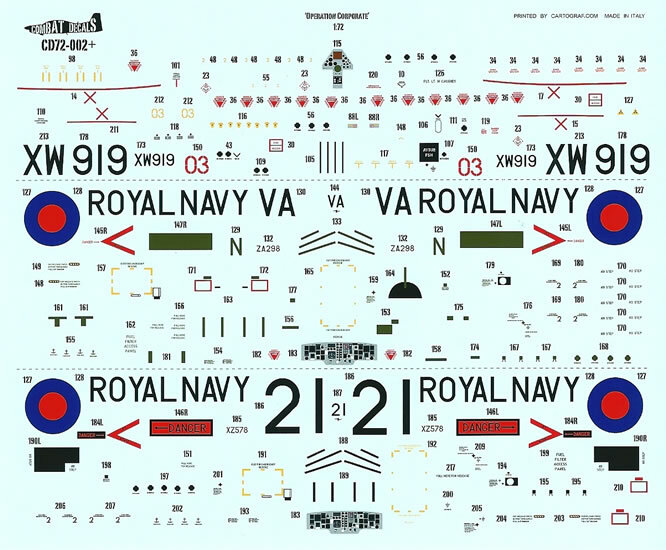 This decal package ticks all of the right boxes in terms of research and quality production. 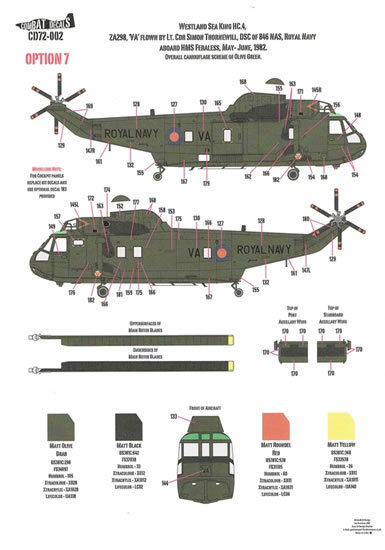 The fact that all eight subjects are covered in full rather than common markings being shared across schemes means that eight models can be completed. This is perhaps more than most individual modellers may wish to do, but it is a great excuse for a group build or sharing the set with modelling mates.